Everybody was thinking it. Philadelphia Eagles fans were thinking it. This was the game where the miraculous, come from nowhere to possible MVP of the league, savior of the Dallas Cowboys ride was going to end for Dak Prescott. After all the miscommunication, misfires, what-in-the-heck-was-he-thinking decisions and oh-he-is-a-rookie second-guessing, you had to figure the Cowboys would be running to dusting off old head Tony Romo. Prescott was making it that easy on them. And so we continue on this unexpectedly dope journey with the NFL’s best rookie you never saw coming and we’ve learned that you can’t give up on Prescott as long there’s time left on the clock. The Cowboys plan to maintain the status quo at quarterback after Prescott’s signature achievement to this point – rallying the NFC East leaders from a 10-point deficit to a 29-23 victory Sunday night in overtime over the visiting Eagles. After a mostly frustrating experience for the Cowboys and their fans in Arlington, Texas, the environment inside AT&T Stadium as OT began suddenly became as lit as a Kanye concert. Prescott shook off the worst performance of his nascent career (for real, dude looked uncharacteristically clueless for most of the game) while the Cowboys overcame their biggest deficit of the season. In the extra session, he just balled out, completing all five of his passing attempts in leading the Cowboys 75 yards for the winning score, capping the drive by finally eluding an Eagles pass rush that had rattled him throughout the game and connecting with tight end Jason Witten on a five-yard touchdown. Prescott remained the center of attention for the league’s hottest team – a position in which the youngblood is becoming quite comfortable. “I’m not going to stop,” said Prescott, who did pause on his return to the locker room to shake hands and receive hugs from well-wishers in the organization. Dallas Cowboys quarterback Dak Prescott (4) signals a first down in overtime after a quarterback sneak on fourth down against the Philadelphia Eagles at AT&T Stadium. 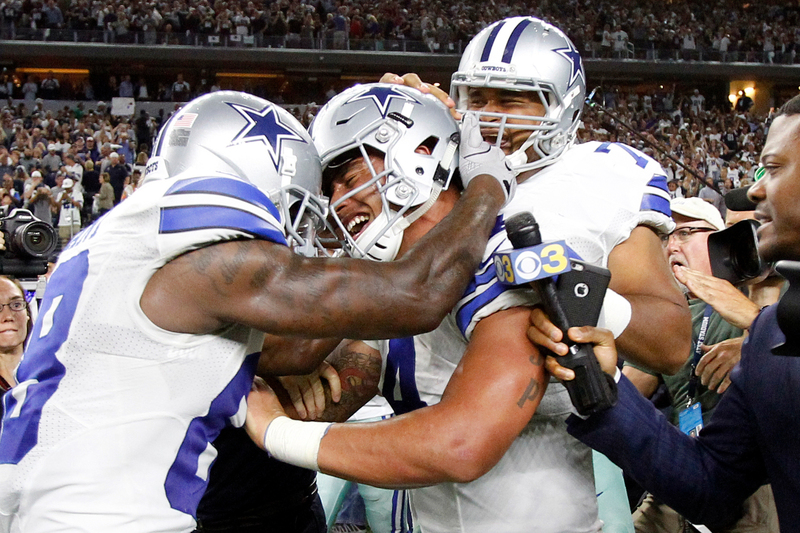 The Cowboys beat the Eagles 29-23 in overtime. Or loosen his vise grip on the Cowboys’ starting quarterback gig. Romo did return to limited practice last week. Had the Cowboys lost to the Eagles with Prescott having his first clunker, would any Cowboys superfan have been surprised if the veteran Pro Bowler bumped the rookie to the second string before this week’s game against the Cleveland Browns? But with another Prescott-directed win, the Cowboys can give Romo’s back more time to heal. Sound thinking. You can best believe head coach Jason Garrett heard that. For most of the game, it sure seemed Prescott wouldn’t get there. He had been so good since taking over for the injured Romo to start the season, you could almost forget Prescott is a rookie. Early on against the Eagles, Prescott reminded us. It wasn’t just that he was a little off. Prescott appeared downright shaky in the pocket, which was startling to see from someone who had displayed such advanced pocket presence in his first six games. Even the return of superstar wide receiver Dez Bryant, sidelined since Week 3 because of a knee injury, wasn’t enough to get Prescott on track. In the first quarter, Prescott did throw a picturesque deep ball along the right sideline that Bryant grabbed for a 53-yard gain. Three plays later, Prescott scored on a seven-yard run. The Cowboys took a 7-3 lead. Then, for a stunningly long stretch, that was pretty much it for a highly efficient and productive offense in this showdown between the top two teams in the division. Philadelphia’s defense definitely deserves some of the credit for that. Fresh off its stomping of the previously undefeated Minnesota Vikings, the Eagles went in on Prescott. 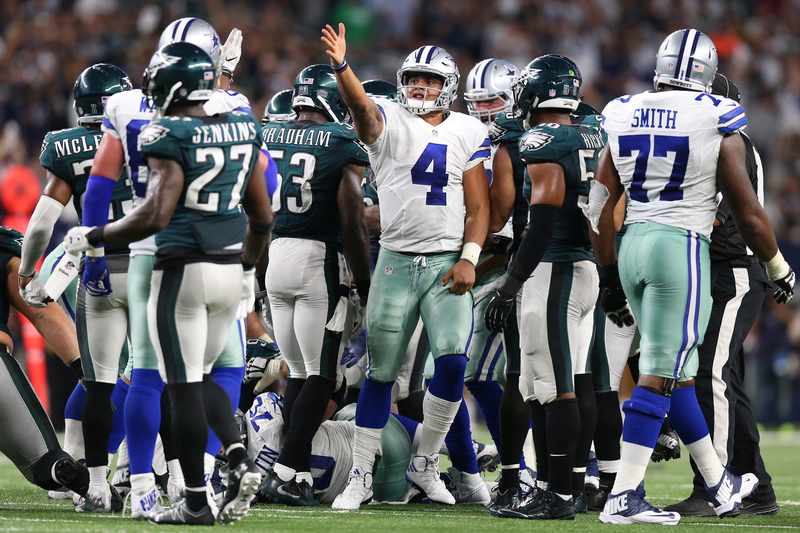 Until late in the fourth quarter, Prescott was being outplayed by Eagles starter Carson Wentz in the hyped battle of NFC East rookie quarterbacks. Then came winning time. About a minute into the fourth, the Cowboys fell behind, 23-13. They hadn’t trailed by that much that late in a game this season. After automatic place kicker Dan Bailey connected from 49 yards, Prescott and Bryant (four receptions, 113 yards) helped tie the score at 23-all on a 22-yard touchdown pass with 3:04 to play in regulation. Dallas won the coin toss and elected to receive. Starting at the Cowboys’ 25-yard line, Prescott completed passes of 10 yards to Terrance Williams and 24 yards to Cole Beasley on consecutive plays. League-leading rusher Ezekiel Elliott (22 carries, 96 yards) also had several nice runs as the Cowboys steadily moved to Philadelphia’s five-yard line. In the shotgun, Prescott felt pressure and ran toward an opening in the middle of the line, which closed quickly. He kicked it in reverse, rolled left and tossed a soft one to Witten, who was uncovered in the end zone. Game over. Peep this: Bryant saw it coming all along. Prescott completed 19 of 39 passes for 287 yards. He had two touchdowns, an interception and only a 79.8 passer rating – his lowest since Week 1. The only numbers that matter, though, are 6-1 – the Cowboys’ division-leading record. With Prescott taking giant steps every day, the Cowboys are in great shape approaching the halfway mark of their schedule, backup running back Alfred Morris said. “He hung in there and the guys rallied around him,” Morris said. “It speaks volumes about the type of player he is, the type of leader he is and just his relentlessness to push forward. We’re way past doubting what he can do. We were way past that in the preseason. With Prescott at quarterback, their fun has no end in sight. Sure, now that Romo is practicing, the situation could get dicey. But the Boys haven’t been on a roll like this in a long, long time. And you know what they say about trying to fix things that aren’t broken.